Stony Brook is committed to using ingredients sourced from our Finger Lakes region to create savory culinary oils and seed snacks. We work directly with New York farmers to source seeds used in our products. We obtain the seeds directly from the farms following the fall harvest. Most sunflower seed, and pumpkin seeds and seed oils sold in the US originate from eastern Europe or China. By committing to local sourcing, we aim to support local production, to promote environmental and economic health in the Finger Lakes region. Most of us are familiar with big steaming bowls of orange winter squash at the Thanksgiving table, and the seeds are usually overlooked as a slippery, stringy nuisance–but they are a hidden gem of nutrition and flavor! Squash seeds are high in protein and fiber, and contain Vitamins E and A, and beneficial carotenoids like lutein and zeaxanthin. When carefully roasted, the seeds develop a robust flavor, making a savory snack. The seeds can also be pressed for their oils, resulting in a savory, nutty flavored culinary oil. The oils complement a wide variety of foods from fresh fruit to salads, soups and marinades. Sunflower is one of the few crop species that is native to North America, domesticated by Native Americans more than a thousand years ago. While we often think of sunflower seeds for the bird feeder, they are great for humans too, a rich source of vitamin E and polyunsaturated fat. 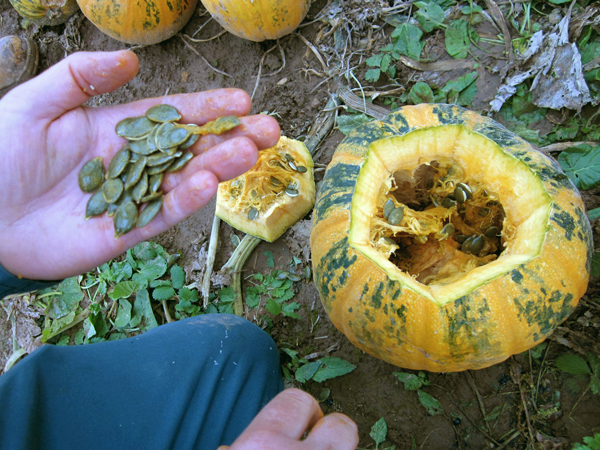 Unlike roasted squash or pumpkin seeds, raw sunflower seeds have a mild flavor. Raw, unroasted seeds in the shell are expeller-pressed and lightly filtered to produce a mild, neutrally tasting oil that is great for everyday cooking. We offer conventional and organic sunflower seed oil, depending on seed availability. Flax seed has a long history, with flax fibers used as far back as 30,000 years ago in what is now Eastern Europe. In North America it was introduced by the colonists, where it flourished. Today, flax is grown for its oil and as a nutritional supplement, and to make linen. Flaxseeds occur in two varieties, brown or golden. Flaxseed contain high levels of protein, dietary fiber, B vitamins, and minerals. The oil contains a high percentage of omega-3 fatty acids, as well as some omega-6 and omega-9 fatty acids. The high levels of omega-3s make it one of the few plant-based sources. Stony Brook purchases flax seed directly from Finger Lakes family farms and gently presses raw seeds to produce culinary oil and flax seed powder. Because flax is high in omega-3 fats, it is a very fragile oil, not suitable for cooking or heating. Flax products can go rancid quickly when stored improperly, so consuming fresh flax is paramount (or it can be stored in a freezer or refrigerator to extend shelf life). Fresh flaxseed oil has a light, crisp and clean nutty flavor and is best enjoyed as a finishing oil in smoothies, breakfast granola or in fresh garden salads.